Another New York take on Sloe Gin, Averell Damson Gin has two things going for it: The Damson is another local specialty, and upstate farms are known for their Damson harvests. The second thing is, for a cordial gin, it’s bottled at a relatively high proof: 66. Because of that you get a strong, spirit that holds up to drinking neat and in cocktails. Let’s take a closer look. The color is a deep burgandy red, bole/terra rosa, with a rich brown note. Neat, the nose is spicy with hints if cinnamon and ginger. Cherry jam in the middles notes with sweet raspberry with a tart edge in lows. Touch or orange and citrus highlights as well. On the palate, starts with a beautiful flourish of spice and fruit up front, rising in unison with a sharp and bright rise. Little bit of gin notes in the background, what tastes like a hint of juniper, with some spice again. Definitely taste some gin in here. Possibly owing to the proof of the spirit, the base character comes through quite sharply. First, in the Sloe Gin Fizz Averell Damson Gin has a sweet and surprisingly subtle character. Fruit sweetened lemonade still at work, but there’s a lot more complexity happening here with orange, lemon, and angelica rearing their heads. Not your father’s Sloe Gin. Unless he makes it himself at higher strength. Well then, maybe it’s exactly your father’s gin*. Iced with Lime, we get the fruit notes a little more rich and full-bodied. Fresh cherry and peach notes in the middle, with citrus, juniper in the mids. The finish is remarkably similar to it neat in terms of the gin like character, but we see hints of cinnamon and ginger again. other baking spices, tart sweet lime. Also quite nice. I’m a big fan of cordial gins which don’t hide their roots. 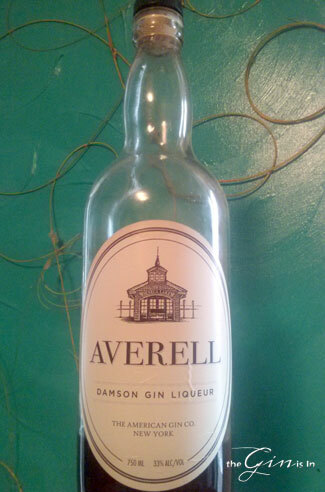 Averell Damson Gin is here on display, and the result is sophisticated, bright, and the kind of gin that fans of Sloe Gins will like, but also the kind of gin that bartenders can work with to make sophisticated cocktails. I quite like this one. *Or your mother. Sloe gin knows no bounds. But we mean Damson this time.